The High Intensity Drug Trafficking Area Program (HIDTA) is an important component of the President's National Drug Control Strategy which provides additional federal resources to those areas to help eliminate or reduce drug trafficking and its harmful consequences. Law enforcement organizations within HIDTAs assess drug trafficking problems and design specific initiatives to reduce or eliminate the production, manufacture, transportation, distribution and chronic use of illegal drugs and money laundering. "reduce drug trafficking & related crime and violence." The mission of Texoma HIDTA (Texoma HIDTA) is to disrupt the market for illegal drugs in the United States by assisting federal, state, and local law enforcement entities to dismantle and/or disrupt Drug Trafficking Organizations (DTOs), with particular emphasis on drug trafficking regions that impact the United States. Facilitates interagency cooperation at the local, state and federal level, to strengthen law enforcement's ability to investigate drug trafficking organizations and associated money laundering and violence. Improve intelligence gathering, analysis, and sharing capabilities to dismantle and/or disrupt drug gangs. 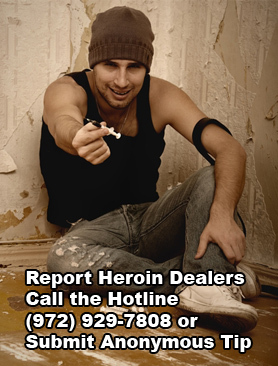 To submit other tips (non-heroin) click on Crime Stoppers. More and more suburban women using heroin .